Back by popular demand, 2019 sees the return of the 10km Nordic Walk. Launched in 2012, the 10km Nordic Walk has been so well supported that we are delighted to offer this event again as part of the Grasmere Gallop. So please come along, take part, and help us to turn this into a brilliant walking day out in the Lakes. 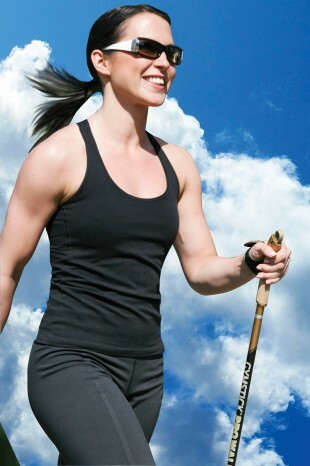 Nordic Walking is a fitness technique that enhances ordinary walking by using poles to increase the use of the upper body and propelling the walker along. Nordic Walking was developed as an ideal form of exercise for Cross Country Skiers to keep fit during Summer months. The Nordic Walking pole is planted at a 45’ angle, where the natural fall of an extended arm would be, thereby propelling the body forward as pressure is put on the pole through the strap. There is a very gentle grip on the pole allowing the walker to guide the pole, to avoid trips, whilst the shoulder and upper body does the work, via the specifically designed Nordic Walking strap. Nordic Walking technique must be learnt correctly if the walker is to get the most out of the activity. Instructors can help you achieve the technique easily using specifically designed Nordic Walking poles. Nordic Walking is perfect to help you power around a challenge such as our 10k Nordic Walk, using the Nordic Walking Speed Technique. It is imperative to stick to the Nordic Walking technique and not break into a run if entering this challenge. Of course there is a competitive element, so the trick is to expend every ounce of energy you have, without breaking into a run.